When I was younger I never really had a favourite player. It was too easy to like the guys who scored the goals and grabbed the headlines such as Johnstone, Hood, Lennox, Dalglish, Macari and Deans (try making a forward line out that lot!). Then you had the players who, it seemed, never had a bad game such was their consistency, for example Hay, Connelly, McGrain and Stanton. 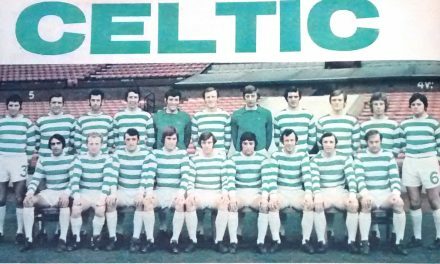 These Celts were the back bone of the team although when you are younger you often fail to notice such qualities. 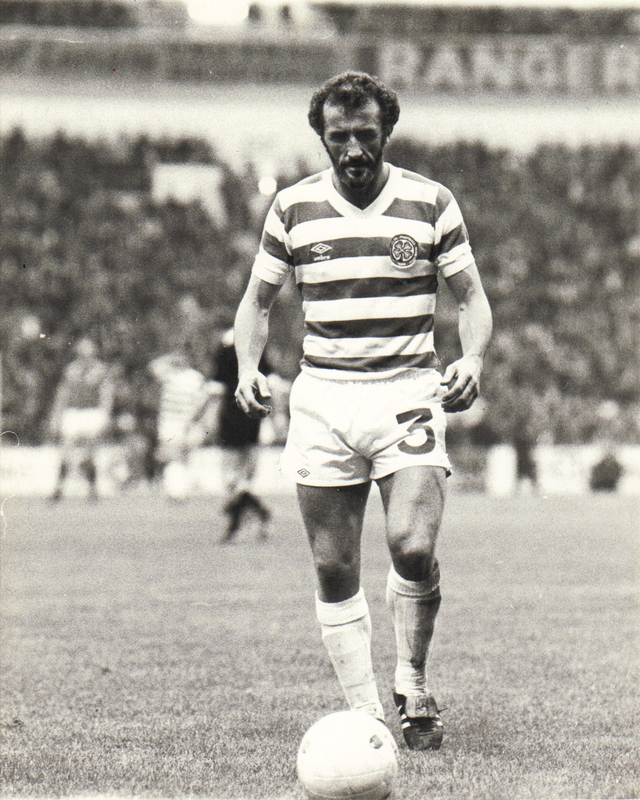 As I grew older Danny McGrain came to impress me greatly. 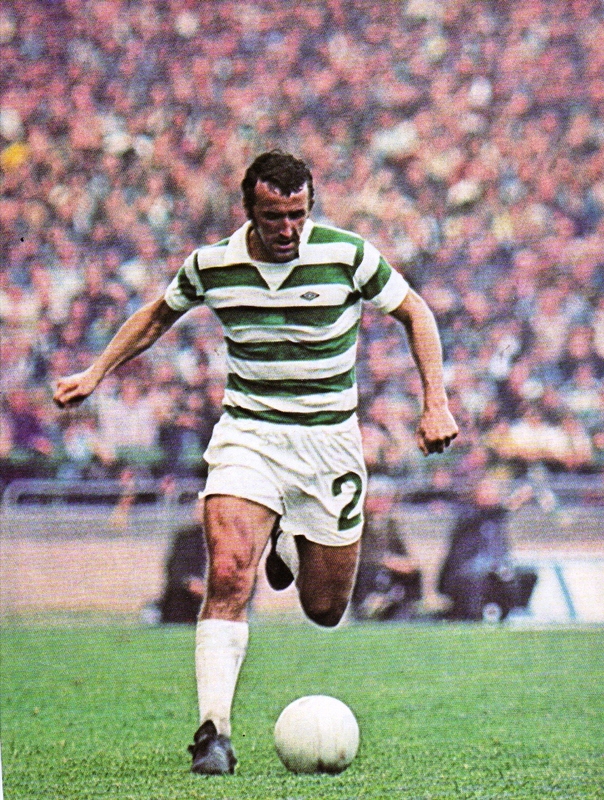 Danny was a wonderful specimen of a Celtic player and had every attribute that you require in a player. He had skill, pace, technique and most of all heart because Danny never knew when he was beaten. You can add courage to that list for Danny overcame three setbacks that would have beaten lesser mortals – a fractured jaw in 1972, diabetes in 1974 and a mystery ankle injury which cost him 18 months of his career when he was at his peak. But most of all Danny stayed loyal to Celtic and gave his best years whilst others turned their back on the club. Between 1974 and the ankle injury suffered in October 1977 Danny was generally accepted as the finest attacking full back in the world and his combination with Kenny Dalglish for Celtic and Scotland during this period had to be seen to be believed. After his comeback in 1979 he had lost a bit of pace and as he became older he played more with the head although by this time he had developed a greater presence on the park and became a successful Celtic captain. It was not unusual to see him control the game from his right back position which was quite a feat. In the late 70’s Jim Craig attended my school to make presentations and surprised us all by advising anyone who played full back not to copy Danny McGrain. Reason being that Danny was totally unique to this position and did not play it in the orthodox manner. In the early 1990’s I read a book in which the players who had won the footballer of the year award in England were to choose their team of best players from their contemporaries. Between 1970 and 1984 every oneof them picked Danny in the right back position such was the impression he had made which is quite a compliment given the fact that he never played for an English team in his career. 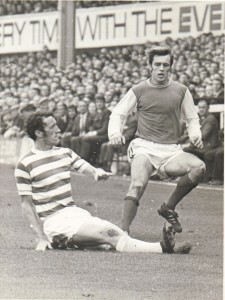 Danny had obviously earned a wonderful reputation through his performances for Celtic and Scotland. 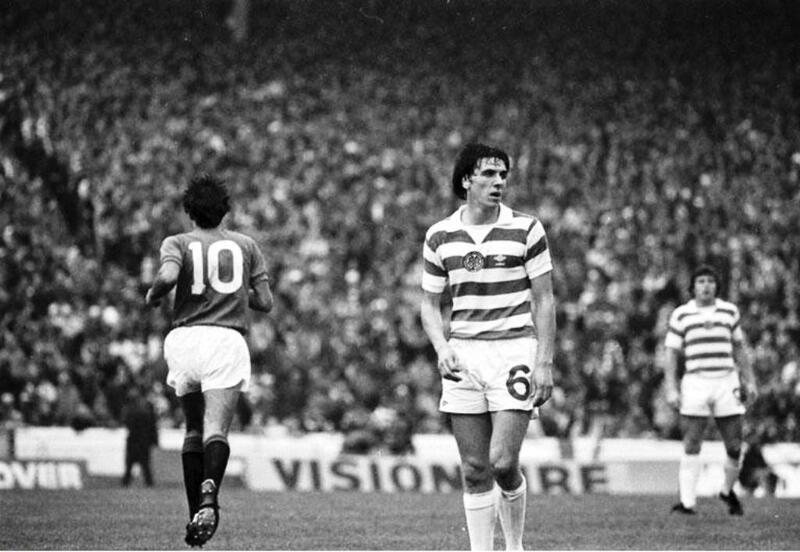 There are a few recollections of Danny in the hoops that will always remain with me. In 1979 as captain he steadied the young Celts around him in the frenzy of the famous 4-2 Old Firm game when it looked as if they might buckle under the pressure, refusing to allow their heads to dropand inspire them to victory. In the Scottish Cup final of 1985 Celtic were leading 2-1 with seconds remaining when Ralph Milne sprinted down the right wing. 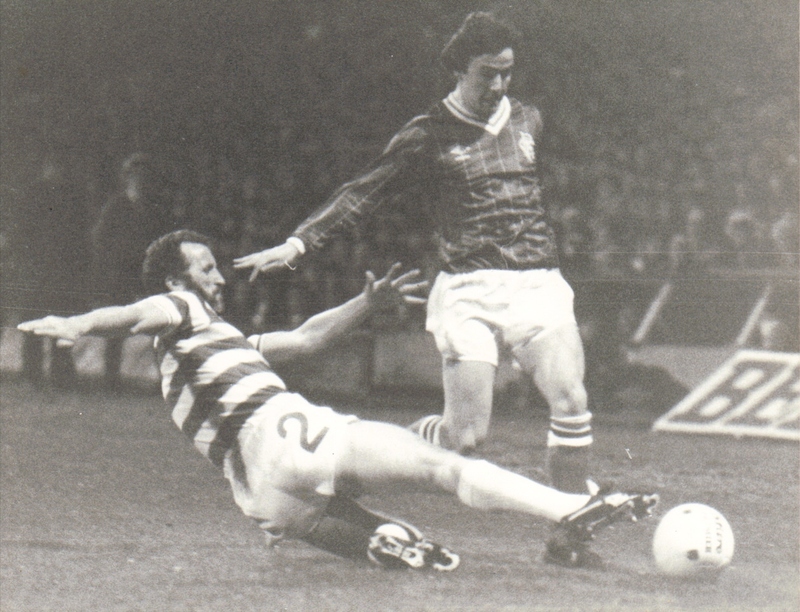 Milne was the fastest forward in Scottish football at that time but even at 34 Danny still had the stamina to chase him and deliver the perfect slide tackle that was his forte. In 1987 Danny played his final Celtic game at Tynecastle in a forgettable 1-0 defeat. Celtic had capitulated to Rangers in the run in and there was a lot of unrest at the club which ultimately led to the departures of mercenaries like McClair, Johnston and McInally and would also cost David Hay his position as manager. Despite this the Celtic fans stayed behind after the game and called for the team to make an appearance. They all came out with one exception. Danny McGrain knew that Celtic had failed their supporters and did not think that it was befitting for Celtic players to take the acclaim of the fans after a season of failure. And so Danny had missed his last chance to sat farewell to the fans. Or so we thought. Three months later Tommy Burns was granted his testimonial game against Liverpool and arranged for Danny to take one final bow in front of a packed Celtic Park, which was a typically generous act from Tommy. There are only two wingers I can recall giving Danny a tough time and they are Arthur Graham of Aberdeen and Jesper Olsen of Ajax. Graham became something of a bogey figure to Danny who was uncomfortable against Graham’s direct physical style before his departure to Leeds United. In 1982 Olsen gave Danny a tough game in the European Cup at Parkhead although the bold Jesper was given only one kick in the Amsterdam return and that was Danny’s boot right up his backside. In the present day Danny is now a coach at Celtic and it should give us great reassurance to look too the bench and see him with the management team. Danny McGrain was and is Celtic through and the memory of Danny Bhoy in Celtic’s green and white will be cherished forever. Image 1 shows Danny in action for the Celts and is taken from Roy of the Rovers in August 1979. One wonders what Thomas Mannion of Glasgow is doing these days and what he spent his two quid on. 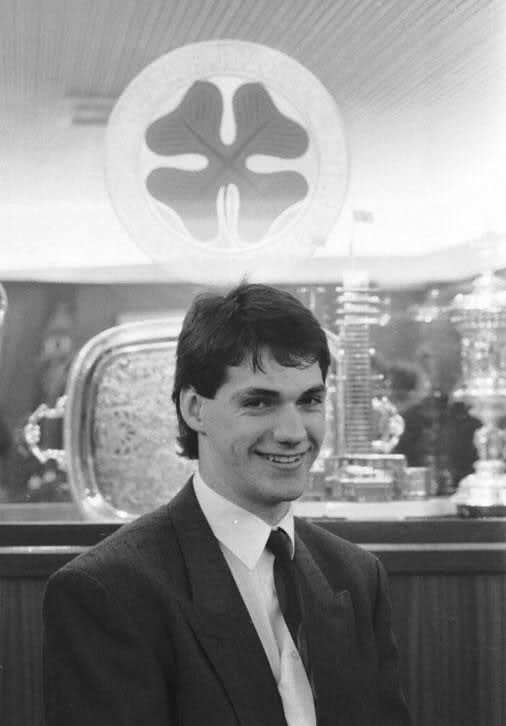 Image 2 is perhaps one of the earliest pictures of Danny in the hoops. 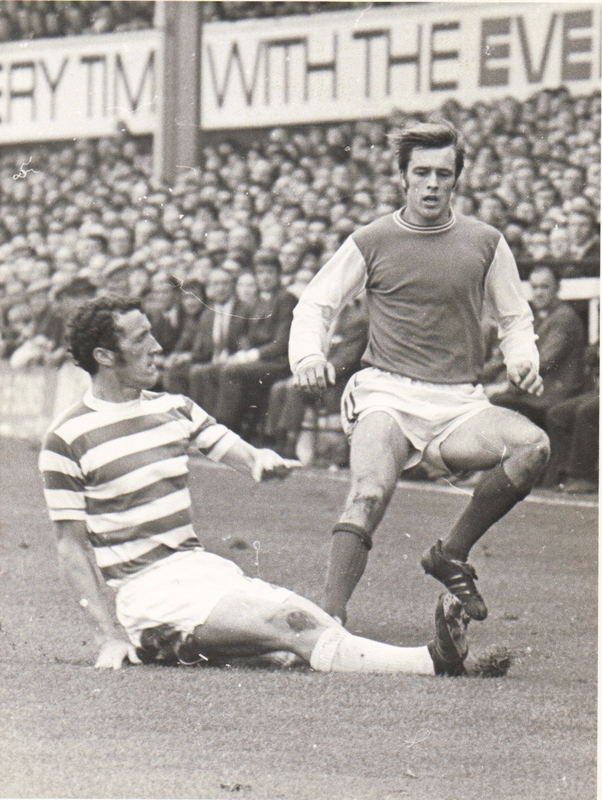 Danny made his debut in August 1970 at Tannadice and this picture is from the Hibs – Celtic clash from 19 September 1970 which would have been only his fourth or fifth game in the first team. A very young Danny is shown executing a perfect sliding tackle on Hi-bees’ Erich Schaedler. Schaedler, a fine full back in his own right, is sadly no longer with us having passed on at the young age of 36 in 1985. May he rest in peace. Image 3 shows an older Danny perform the art of the slide tackle again, this time on Rangers’ John McDonald from a game played on 23 March 1983 at Parkhead which finished in a 0-0 draw. In image 4 you can see Danny at Ibrox Park in 1980. 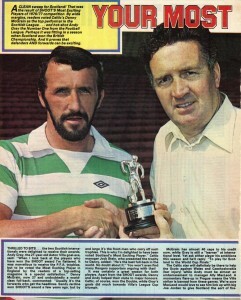 The last image shows Danny receive Shoot magazine’s Scottish player of the year award in the summer of 1977 shortly before Celtic’s tour of Australia and the Far East. He is presented with the award by Jock Stein and I have spared you the sight of Andy Gray’s ugly mush on the next page as he was the English player of the year at that time. NB – Click images to enlarge.